Group chat interaction is making the world small. A lot of time during a group discussion, it is hard to imagine how a chatter looks like. Now you do not need to, you may put a face to a virtual name. 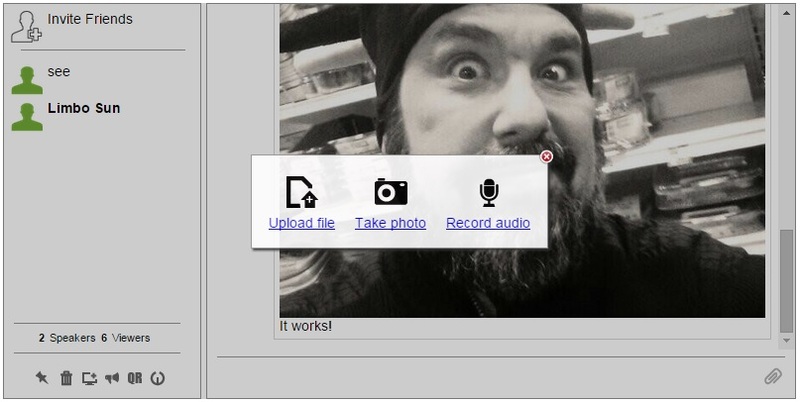 News: We are happy to announce a new feature that let chatter add their own selfie using their pc camera. The process is pretty easy (see below). Note, you will need to have a camera connected to your PC or laptop (at the moment this option is not available in the mobile version of RumbleTalk). Guest, Facebook, Twitter or Your own custom logins. Only once you are logged-in, you can see the small paper click icon. Clicking on the icon will open a small window with several options. Click on the camera icon. You will need to approve the usage your pc camera. This is a common browser request when an application wishes to use your camera. Step 4 : Choose the best photo and upload. Take several photos until you are happy with the results and then upload it to the chat room. It then takes seconds and the selfie will show and shared with all the chatters in the chat room. We continue to add features to our group chat room service so your discussions with your community will be extra valuable.